Stewart Reid, Head Concierge at The Grand Hotel & Spa, York, has been voted Chairman of The Society of the Golden Keys Northern Region. 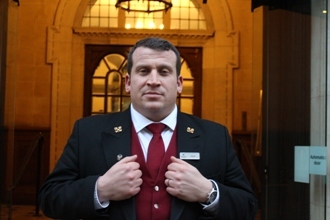 Following Mr. Reid's 2017 nomination as Regional Concierge of the Year, he has been appointed Chairman with responsibilities including building and maintaining relationships between Golden Keys members and their hotels to enhance guest experience; hosting quarterly regional meetings; and work with local and regional attractions to ensure Concierge confidence when recommending experiences or products to guests. The Society of the Golden Keys was established in 1952 to build friendship and develop a network amongst concierges. Society members are part of an international body, Les Clefs d'Or, and are recognisable by the cross keys worn on their lapel. The Grand's concierge team offer a wide range of services including organising surprise parties and proposals, platform luggage assistance to and from the nearby York railway station, tailoring tours and excursions for each guest, and more. Speaking about his appointment, Stewart Reid said: "I'm delighted to receive this honour and I'm very pleased to be upholding the good name of The Grand and The Society of the Golden Keys. We strive to offer above-and-beyond service at The Grand - nothing is impossible. "Those that wear the cross keys work at the best hotels in the world, and there's no doubt that The Grand is in that category." Philip Bolson, General Manager at The Grand Hotel & Spa, said: "We're incredibly proud of Stewart's achievements - he's a credit to The Grand, going above and beyond to cater to our guests' every wish. "We place a huge emphasis upon guest experience and satisfaction at The Grand Hotel & Spa, and Stewart is a key part of delivering this to each and every person that comes through our doors." For more information on The Grand Hotel & Spa, visit or contact The Grand team directly on 01904 894580 / .